I''m constantly reading on a handful of local weblogs the accusation that the 'Council' is uniquely responsible for the burden of decline suffered by Margate or Thanet in general, over the last twenty years. The fact that all seaside towns, perhaps with the exception of Brighton, have found themselves in a similar economic position, goes quite unnoticed or is simply ignored and those who use inflammatory words such as "criminal neglect", appear to have no real idea of why the great British seaside has suffered so and indeed who is responsible, unless of course, its, "The council." Thanet has a disproportionately large population of elderly residents and the lowest life expectancy in Kent. The health of people in Thanet is the worst in the South-east. Those residents over the age of 50 (which includes me) now account for 40.8% of the population, the highest proportion of 50+ adults in the country. This figure will continue to increase as time goes by and presents tough financial challenges to the statutory agencies at a time when central Government budgets are in unprecedented crisis. Adults over 65 and 85 are once again higher than the national picture and annual incomes are lower. This has significant implications in regard to sustaining the local economy of our towns where disposable income is involved. Thanet is characterized by household incomes significantly below the national and regional average but demand for new housing continues to increase and in particular those with disabled access. Meanwhile, Government is reducing its support for disabled facilities grants for the many homes that require it locally, leaving Thanet to find the funding and a £2.3 million backlog in applications. Thanet has the highest levels of domestic abuse in Kent. Unemployment is more than twice that of the South-east as a whole but qualifications are below the average. Thanet experiences the highest levels of criminal damage in Kent. The demographic mix in Thanet is changing rapidly with significant increases in ethnic groups. I could go on but I think readers will have the picture by now. Recently, I wrote that my own back-of-an-envelope calculation from a recent presentation suggested that every man, woman and child on the island has been subsidized by Government, in terms of services to the sum of £7,000 each. I also reminded people that collected council tax only pays 40% of what we need to deliver all our local services and that the balance of 60% comes from Government. This is about to be slashed, leaving the close to £6 million gap over five years, reported in Your Thanet last week. This last decade of Labour government policies has proved disasterous for the island and yesterday's papers revealed what may have been going on behind the scenes in regard to Labour's efforts to win new seats through the simple expedient of making them poorer and more diverse. From looking at the published league of local deprivation, Thanet North sticks out like a sore thumb. It should be Labour but it's not, a tiny island of blue surrounded by a sea of red. But you draw your own conclusions; don't take my word for it. Most of us have, at one time or another played the board game 'Monopoly', so you'll understand the principles that lie at the heart of any local economy, the value of property and the disposable income of the population or indeed, the visitors to the area. So, Thanet Bloggers and local papers and local film producers who are so quick to criticize, tell me where the money comes from to deliver on all your grand plans, if efforts to rebuild and regenerate our local economy are frustrated? We need to give local people jobs, homes, opportunities and a future and these can't be found by turning back the clock or even under this Government, which seems so cynically intent on perpetuating and growing our benefits dependent culture, keeping us poor by sending us its poor and homeless in large numbers and against our wishes. Thanet needs investment and encouragement and new ideas and industries to put people in work and above all, it needs money, lots of it, to reverse the damage done not by the council which simply delivers services within its budget but by a dysfunctional Labour government with its own agenda and which is now being seen for what it really is. Careful DrM you'll have the thought-police after you! To be honest it's not really Thanet as a whole. Broadstairs is really nice as is Kingsgate, Palm Bay, parts of Ramsgate near the seafront, Cliffsend, Westbrook, Westgate and Birchington is ok but bit full of over 80s for me. The problem is Margate. It's controversial but perhaps TDC should stop trying to promote all 3 main towns as tourist attractions. Pump more money into Broadstairs and Ramsgate and just forget about Margate. No amount of money thrown at it will help it now. Pull it down, start all over again. So goes the old song. 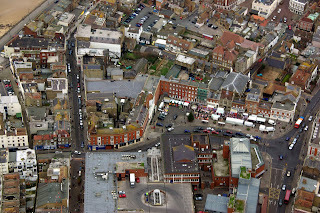 If Westwood Cross had not been built, Margate & Ramsgate High Street's might still be active ventures. So, close it ALL down, move everything - Lock Stock & Barrel over to Westwood Cross (shops). Then start a Margate/Ramsgate re-build. Get rid of all the old rubbish and build a radical modern centre like Plymouth (for instance). Leave the 'old town' if you must, but the High Street areas are rotten crumbling slums. visit, not just the 'apprentice' scrotes. (That show put Thanet further down the ladder of ridiculum than the TDC!!! has managed in years). What Thanet needs is a revolutionary Council that will really try to get something going, and not just talk about it and fob resident's off with lame excuses all the time. Have you had a chance to walk round Herne Bay,seaside town,only two empty shops and very cheap parking prices. The streets are clean and not just the main roads,but the small side roads as well,we did not see any torn bags even though plenty of seagulls were in evidence,so why the difference?,could it be the better class of residents?or is it more to do with a better run council? Thanet has suffered from years of promises,most of which have not come to fruition and not all the blame can fall on the Government or the council.Certain local businessmen have done a damn good job for Thanet(Thorley and Gadd come to mind,but others who shall remain nameless have destroyed both the infrastructure for leisure and the reputation of Thanet,there are ways round lack of funding but getting our good name back will take a long time to get back. Dr Moores, I frequently have to travel down to the south coast, Worthing, Bournemouth, Poole, Southampton, etc. and I can tell you they are all bustling and thriving. Margate is out on its own with regard to decline and Ramsgate not far behind. Yes there are very real problems with regard to Thanet as a whole but you have to ask yourself why this has happened. A great deal of money has been pumped into Thanet, where has it gone, there is no real evidence of the regeneration spend apart from the Turner Centre. The conclusion has to be that there has been some mismangement. Two points here. Herne Bay doesn't face the same scale of challenges or indeed have the same unique demographic problems as Thanet. You can't simply knock things down and start again. A council delivers public services and channels Government funding in certain directiosn and what private landowners and businesses wish to do with them properties is very much up to them! You have to compare like for like, perhaps Hastings or Sheerness perhaps. Yes a great deal of money has been directed at Thanet but not nearly enough to do more than place a sticking plaster over a much greater problem. We have a huge retired population and a steadily growing and benefits dependent culture, thanks to Government. We also have a narrow view of the rest of the country with the sea at our back. Local Government can only spend the money as directed by Government or against policy such as regeneration and rely on the private sector to do the rest. It does not have a magic wand. Hastings probably doesn't have most of its seafront owned by private landlords & companies who don't give a damn about the area as they sit on the land watching its value increase. They must be laughing their ar-es off as its the council that gets the kicking from people who are too thick to find out the truth for themselves. They just read the local rag and swallow every lie.